Dr3 mediates regulation of the cell division cycle. Negative selection and anti-CD3-induced apoptosis are significantly impaired in Dr3-null mice. The Dr3 knockout mouse was developed in the laboratory of Eddie Wang at the Imperial Cancer Research Fund, Lincoln's Inn Fields, London. A DR3 targeting vector, replacing the entire DR3 coding region with a loxP flanked resistance cassette, was transfected into GK129 ES cells. Correctly targeted ES cells were injected into C57BL/6 blastocysts. Chimeric offspring were mated to C57BL/6 mice to yield mice heterozygous for the mutant allele. Heterozygous mice were interbred to generate homozygous Dr3-/- mice. Taconic received embryos from CRT in 2015. Wang et al. 2001. DR3 regulates negative selection during thymocyte development. Molecular and Cellular Biology. 21:3451-61. 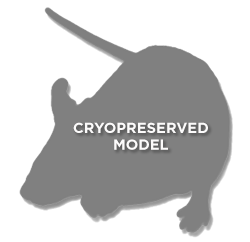 Access to this model requires execution of a Limited Breeding Agreement and cryorecovery services to recover the line. Current Limited Breeding Agreement fees for this model are $3,000/€2550 per year for non-profit users and $10,000/€8500 per year for for-profit users. Cryorecovery fees are additional.